Thanks for visiting the Blackfriars Youth Shakespeare Website, kindly hosted by the Rivendell Club. 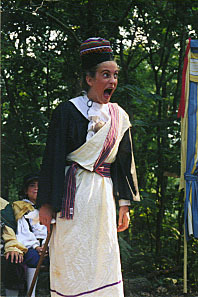 Our initiation into Shakespeare productions began in 1996 when, after several years of unsatisfying attempts at dramas written expressly for children, we launched into a revolutionary idea of feeding little kids the big kids stuff. It worked! The actors and actresses, aged 6-11, rose to the challenge and haven't given it up since. 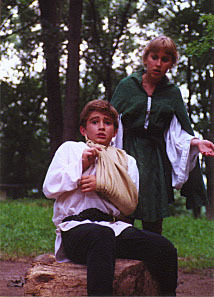 Presently, we are a group of seven home-schooled families who contribute not only their children, but the parents' talents as well to give a full scale outdoor production of Shakespearean comedies. We have two groups, the 6-12 year olds, who will be performing "A Midsummer Night's Dream," and the 13-18 year olds, who will perform "The Merchant of Venice. Amongst the cast are some accomplished musicians, so every play is sprinkled with live music in varying amounts. 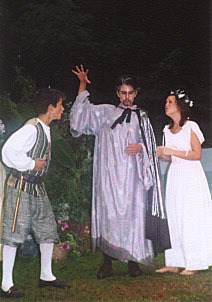 In 2001, to accompany the "Tempest", a small orchestral score was added to create a lively storm scene, as well as harp music to help the fairies seemingly float through the air. The dads work together to design and build the sets, while the moms are busy either directing or making authentic Elizabethan style costumes. At the end of the day, our satisfaction lies in working together to accomplish something both entertaining and beautiful, that keeps our audiences coming back year after year. 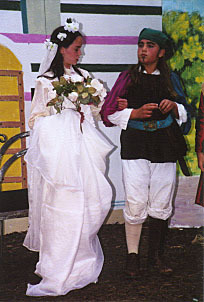 Previous performances include "Comedy of Errors", "Midsummer Night's Dream", "Love's Labours Lost", "As You Like It", "Twelfth Night", "Taming of the Shrew" and "The Tempest". In lieu of a set admission fee, tax-deductible donations are accepted for the St. Johns Parish Family.